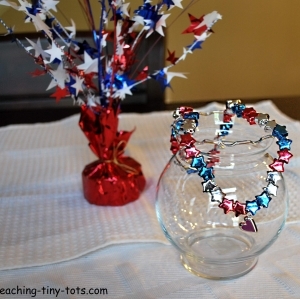 Here is a toddler activity using red, white (or silver) and blue star beads to make a necklace or bracelet. 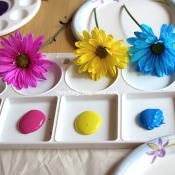 Easy classroom craft! Add a charm to personalize it. Red, white (or silver) and blue star or pony beads. 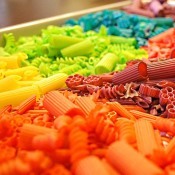 Separate beads by color in a muffin tin or plastic containers. Measure a length of beading cord around your child's wrist or neck. Be sure to add about 6 inches or more to make it easier to string. 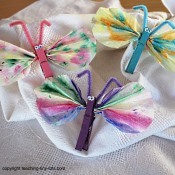 Fold a small piece of masking or packing tape at the bottom of the bead string. This will keep beads from sliding off. Lay out a pattern of red, white (or silver) and blue beads. String beads and add charms if you desire. Hold securely and try on child before knotting. Tie a double knot and add a drop of craft glue especially if you use stretchy beading cord which can slip. Let dry and snip extra cord. Great opportunity to practice counting. For older toddlers you might want to introduce a complex pattern like RR, WW, BB or RR, W, BB. 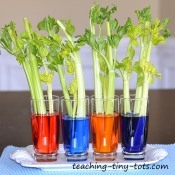 Counting: Practicing counting how many of one color. Represent (How many is two,three, etc?) Ask your child to give you two beads. Quantity (More, Less, Equal): Make two piles and ask which one has more or less. Simple Patterns: Laying beads out in a row in simple patterns and identifying the next bead. In the United States Independence Day, often called the Fourth of July, is a federal holiday commemorating the adoption of the Declaration of Independence on July 4, 1776. Many people celebrate Independence Day by sending off fireworks, attending parades, having barbecues or holding picnics. A great way to introduce an activity is to find a book about the topic.